The AVN-PX8X4C Mix Engine, as well as using AES67 audio streams, accepts 24 analogue mono input channels on 3 x DB25 connectors and output 16 analogue mono channels on 2 x DB25 connectors. 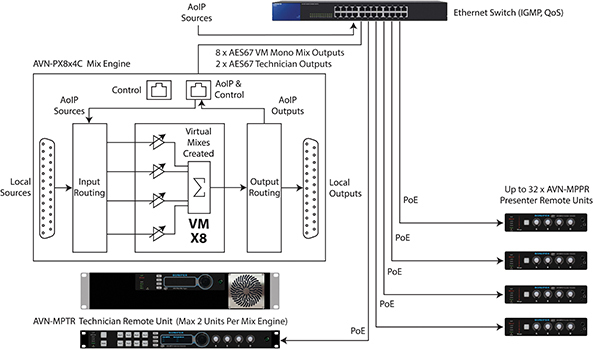 Each mixer unit is able to create and control 8 virtual mixers, each capable of mixing any 4 sources (analogue or AoIP) to a single mixed output that is available locally at an output and via an AoIP stream (to the Presenter Unit and other destinations). The analogue audio line-up level will default to +18dBU = 0dBFS. A built-in webserver is used for configuration settings, input/output routing and for defining which Presenter and Technician Remote Units are assigned to the particular Mix Engine and Virtual Mixers. Up to 4 MPPRs can be assigned to each Virtual Mixer on a first-come first-served basis. 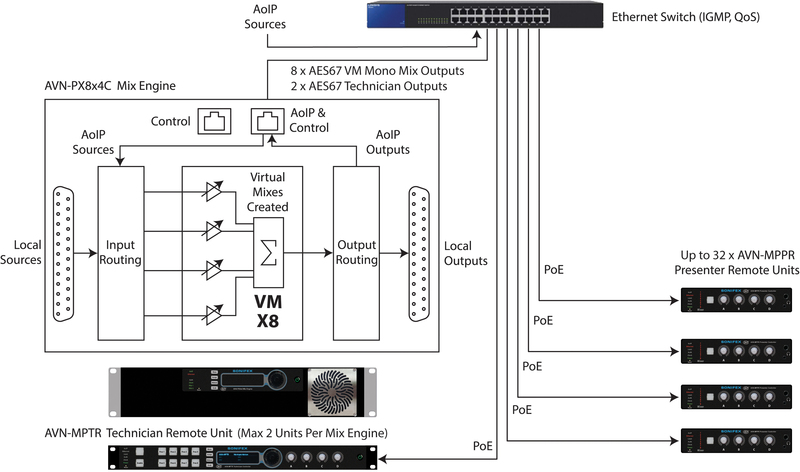 It’s also possible that both MPTRs could also select the same VM so a maximum of 6 devices can control the mix levels of a VM. The Mix Engine will allow a maximum of 32 audio over IP input streams (each stream can be up to 8 channels). There are 8 virtual mixer outputs available. Each Virtual Mixer has 4 sources and 1 mixed output. There are also 2 more monitor outputs which play out the audio of the VM selection made on each of the 2 connected Technician Remote Units. The Mix Engine has dual universal AC power supplies which are hot-swappable in the event of failure and have a green LED to indicate within spec operation. The front panel has LED indications and GPOs to warn of power supply failure. There are also front panel LEDs for network and sync/clock failure. Product Function: The mix engine houses the hardware where the complex routing, mixing and DSP functions are performed. 8 virtual mixers, each with 4 mono channel inputs to one mono output. 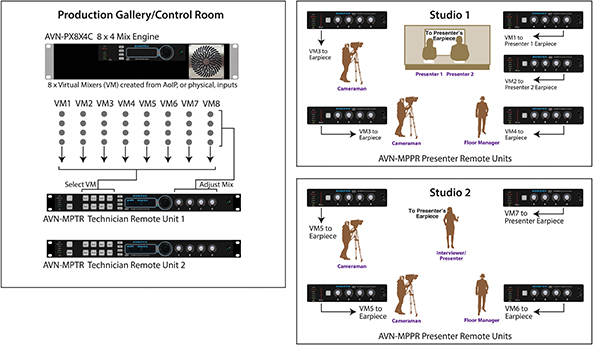 Virtual mixers controlled by connected technician and presenter remote controls. 24 analogue inputs and 16 analogue outputs on D-type connectors. 32 logical inputs & 10 logical outputs using AoIP. Dual hot-swappable AC power supplies. 2 x 1Gb Ethernet ports & 1 x SFP port. Status LEDs and OLED display. 20 x configurable GPIO ports.